When I was just shy of thirty, I started my own garden service business. I did it against my parents’ advice, which is not my habit. My dad owned a business when I was a child, and those six years took a huge toll on his health and our finances. Before I was in middle school I knew that the best way to start a business was with capital, and I had no capital. I justified it in my mind, though, because the business I planned had almost no overhead costs and no inventory. Eighteen months later, the planes hit the twin towers, and the economy took the first of many hits. It was hard to convince people to spend money on custom yardwork. Every month I worried about paying my bills. My health insurance was astronomical, and at the time it did not cover the cost of the medication I took for narcolepsy. I was living in my grandmother’s house, and although the mortgage payment was less than I could have paid anywhere for rent, it was still difficult to make the payment each month. Taxes, social security, and workman’s comp for a sole proprietorship was much more than I ever anticipated. One of my best friends was a counselor, and after several months of anxiety I went to see one of her colleagues. (My exorbitant insurance covered it.) I’ve always been a fan of counseling, and this guy was a godsend with his dry wit and even temper. I think I just stared at him right then. I live in a sheltered part of the world. At that time, there were no homeless people under the bridges of Gainesville. (That has changed since then.) But I had seen the streets of Lima and Iquitos, Peru, where families were so desperate that they put their young boys on the street, or put them in a dumpster to die. At the very worst, I would live out my days in comparable luxury. That lesson stuck more firmly than any lesson of my life. I was in business for myself for eight years, and there was never another month when I was anxious about my bills. Never. At the end of it, I closed the business not because of the worst drought we’d ever seen in this area or because of the ever-declining economy. I closed it to go back to school. I was in debt, but not unmanageably. 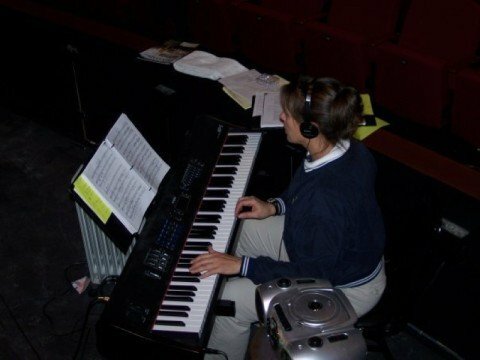 Before I finished my master’s degree, I was offered a job teaching chorus and musical theatre. A starting teacher’s salary is all that the cliché describes—just barely enough, and not enough to pay off all my debts and my brand-new student loan, but once I finished my master’s degree, my raise made me comfortable. When I was in business for myself I sometimes had to live below the poverty level. I found that if I didn’t have 500 cable channels, if I unplugged everything when I wasn’t using it, if I didn’t eat out often, if I took contract jobs doing shows for other schools, and if I was careful to document everything for the IRS so that taxes didn’t kill me, it was fairly easy for a single person to manage on less than what I made every month. Worrying about money was a thing of the past, and trusting God with my finances was not even an act of faith any more. That’s a pretty story, isn’t it? I could end it right there, and we would both feel good about how things work out for good. This, my friends, is why I did not choose to write fiction. Reality is much more interesting. I lost that job, and the particulars of that loss are another story for another day. Because I wasn’t surprised to lose the job, I had already been nosing around for another job for several months before the hammer dropped. Between the horrible state of the economy and the specialization of my field, jobs were somewhere between scarce and non-existent. (I could say “mythical” and probably not strain credulity too much. I have responded to job postings in my field that ask for education and credentials that do not exist in the real world, but, once again that is for another day.) All this to say that when I found out officially that I would be unemployed, the old panic roused and reared its head. I was facing the real possibility of what I feared years ago. This time, my car was at least paid for. (Those of you who know me know that if I believed in a wrathful God, I would very much fear that he would take away my car just because I love it so much. As it stands now, I prefer to believe that it is one of the blessings he has provided to sustain me.) I still worry that at the very least I will have to rent out my grandmother’s house and move in with my parents so that I can keep up the mortgage payments. I worry that I will have to drop my health insurance. Recently I was reading from Amy Grant’s Mosaic. I used to live in Nashville, and in addition to the great respect I have for her based on what I knew of her, I’m genuinely fond of her. (She and Tina Fey are the two best buddies that I don’t really hang out with yet.) That said, I wasn’t expecting to be impressed by what she had to say about money. To my knowledge, she has ever been in my kind of financial distress. She told a story, though, about two men. One was a pastor who made one hundred dollars a week. The other was his friend from college, who made six figures. That is trust: doing what you believe you are called to do and trusting that God will provide. I had to stop reading right there and think for a few minutes. My first reactions were at worst mercenary and at best pragmatic: I can’t find a normal, salaried job with benefits. What if I could find someone who will provide for me—pay my phone bill, electric bill, car insurance, etc.—in the philanthropic and good-hearted belief that I’m doing something good by doing what I love? Lots of people have told me this year that they respect my work with students and believe that I’m good at it. Many have suggested that I start my own business again somehow. I have balked at the idea because of the financial worries it induces, but what if it were different? How could I find what her friend the pastor had—someone who promised to pay me whatever I need? Who did he have? The deacons of the church? An independent backer? My mind reeled for a moment, then I realized (perhaps miraculously, considering how dense I can be) that I had missed the entire point of her story and what the pastor had said. I already work for someone who promised to pay for whatever I need. I should have run out of money months ago, but I didn’t. I don’t have the job that I think I need, but I’ve never stopped doing the work I love. In fact, I’m now doing more of what I love–more freely, more completely–than I was when I had an employer. If I’m honest, I have to admit that I have laughed more and smiled myself to sleep more in the last year than I ever remember. I am doing what I am called to do. God provides. It’s not even faith; it is undisputable reality. Grant, Amy (2007). Mosaic. New York: Doubleday/Flying Dolphin Press. Damn. You are the epitome of grace. Never let anyone tell you otherwise.